What might you find in a moonlit Louisiana swamp? Alligators and Luna Moths, among other nocturnal creatures. Spanish moss, swaying in the nighttime breeze, as it hangs from Bald Cypress trees. Lots of stars in the night sky. Crickets chirping and cicadas trilling, along with a chorus of frogs. Orb Weaver and Banana spiders spinning their magical webs. And the annoying whine of mosquitoes, no doubt, as they are sometimes nicknamed the Louisiana State Bird. Swirling air currents inspired by the sky in Vincent van Gogh’s Starry Night. Much of my fiber art references nature, particularly the natural environs of my adopted home state. While not a native to the area, I’ve come to appreciate the beauty of the plants and animals, some of them endangered or threatened species, in the swamps, forests and bayous. I selected By the Light of the Silvery Moon to interpret for the whimsical possibilities. The song, originally published in 1909, was written by Gus Edwards & Edward Madden. A cartoon version with ink illustrations by Myron Waldman was produced in 1931 as part of Fleischer Studios Screen Songs theatrical cartoons. They ran on television 30 years later, and I remember “follow[ing] the bouncing ball” to read the lyrics along the bottom of the screen. Popular for years, the tune was used in/by numerous performers, recordings & films. My challenge in making this quilt was depicting nature in a low-light situation, rather than my usual bold and bright colors. 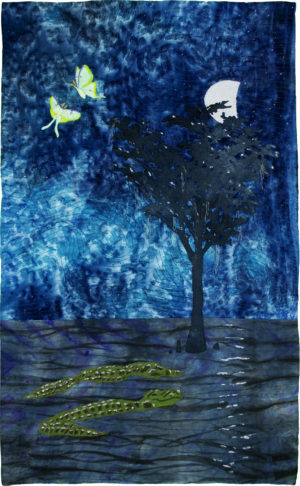 Hand dyed and hand painted base fabric, ink pencil (moths, gators), shibori technique, hand and machine embroidery, machine quilted, fused applique. Hand dyed and commercial cotton fabrics, organza, textile paint, ink pencil, thread.